Sacramento Swimming Pool & Spa Leak Detection | Bullseye Leak Detection, Inc.
Are you wondering, “Is my pool leaking?” If you’ve seen a sudden increase in water bills or notice areas on your lawn that seem to be swampy, you may have a leak in the pipes or in your pool. The best way to find out if you have a leak is to get your system tested. Our technicians test all types of systems, from standard single-pump pools to the most elaborate multipump backyard water wonderlands. Testing a basic residential pool, including both the structure and the plumbing, costs $375-450. For larger and more elaborate systems requiring swimming pool leak detection, call or email our office for a quote. By pressure testing each line separately, we can isolate the specific leak. 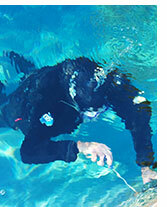 We inspect the structure both from the surface and underwater using scuba equipment. Our technicians inject nontoxic dye throughout the structure to determine if a gap or crack is cosmetic or the source of leakage. Our leak detections have a 30-day guarantee, so if a secondary leak occurs and your pool is still leaking, we'll come out free of charge to locate that one, too! All pool and spa systems must be treated to prevent bacteria and algae growth. Typically, treatment means adding liquid or tablet chlorine. Bromine systems work similarly. Saltwater systems provide chlorine treatment but use an entirely different delivery method. Electrolysis separates the salt into its elementary parts: chlorine and sodium. Many homeowners enjoy the feel of water treated with salt and conditioner. When a saltwater pool or spa leaks, it loses salt and conditioner, too. With the addition of new water, the system becomes diluted, necessitating the addition of more and more salt throughout the year. With bromine and chlorine systems, chemicals must be added continually to keep up with water leakage. Heavy use of salt or chemicals is a strong indication that you have a leak. A standard pool has a suction line and a return line. The first pulls water out of the pool. The second pushes water back into the pool. A leak on one of these lines can occur anywhere between the pool port or skimmer and the pump. A spa adds an additional suction and return line to the mix. As do a fountain, disappearing edge, and waterfall. When scheduling your appointment for spa leak detection, we request a thorough tallying of all the features on your pool/spa in order to provide accurate pricing and time allotment for testing. Pool surfaces can be Pebble Tec, gunite, fiberglass, or vinyl liner. Each ages and shows signs of wear differently. A leaking crack in a Pebble Tec pool might camouflage itself for months whereas a glaring crack in a gunite pool might be only cosmetic and not leak at all. Our technicians thoroughly test the entire structure, including pool walls and floor, steps, benches, lights, tiles, ports, and skimmers. If the structure leaks, our next step is to patch it with two-part marine-grade epoxy. Temporary patches help us narrow our leak search and stop immediate water loss. They are not a permanent or guaranteed solution. Whether your pool has a single-pump or a multipump system, we always begin by inspecting the equipment for wear and leakage. While we are not licensed to repair pool pumps, we can identify leak sources and guide you to a reputable, licensed contractor for such services. 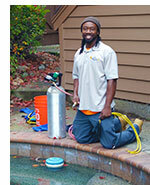 Contact us today for the best in pool and spa leak repair in Sacramento, CA.